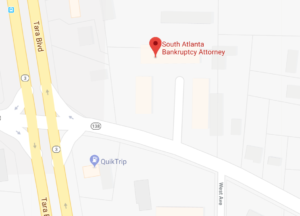 We specialize in bankruptcy law and debt relief in Jonesboro, GA and the surrounding counties of Fayette, Coweta, Spalding, Heard, Carroll, Haralson and Troup. We have over 30 years of combined experience and can help you with any questions concerning bankruptcies. We can provide guidance dealing with tax issues, student loans and debt relief. Bankruptcy is a remedy of last resort, and we know that you've been doing everything you can to avoid filing. But a reduction in income from job loss, divorce, or uninsured medical expense can push anyone to the point where you need real help. This economy is causing problems for everyone, so don't feel like you're alone. You're not. How much does a bankruptcy case cost? How will a bankruptcy affect my credit ratings or employment? We can answer these and all your bankruptcy questions in your free first consultation.